Sharks are deadly predators with incredible natural advantages, from internal ears that detect the distant sounds of a struggling fish to nasal organs that hone in on the electrical fields of their prey. 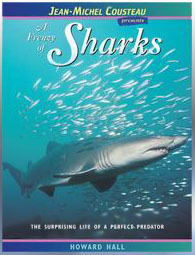 With startling, fact-packed text and spectacular photos, "A Frenzy of Sharks" reveals this creature's fascinating world. Readers meet graceful blue sharks, lightning-fast makos, burrowing angel sharks, and powerful hammerheads, as well as lesser-known wobbegongs and the ethereal manta rays. Going beyond sharks' thrilling life as hunters, the book captures a less-known of this remarkable animal; images showing them squirming inside egg sacs and effortlessly transporting human passengers reveal a side of sharks rarely seen. Reef Fish I.D. 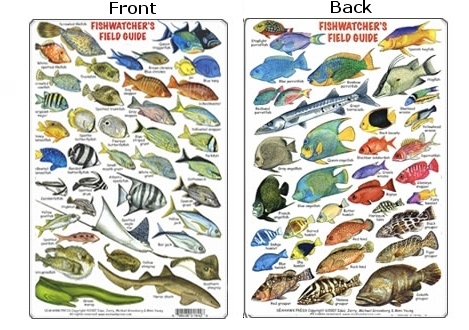 Chart:Â Colorfully ilustrated fish chart that can be used underwater to identify fish.Â Great for snorkeling and diving.Â Printed on waterproof plastic.Â 4" x 7"
A two sided, waterproof guide to gamefishes of the tropical Alantic. 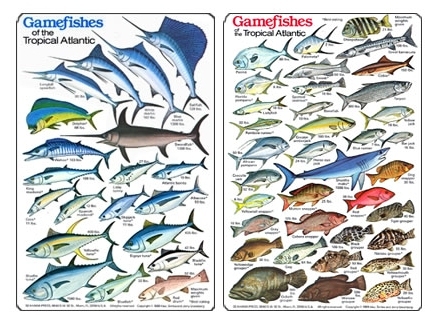 Features 56 exciting gamefishes, some found world-wide. 6 X 9.5". 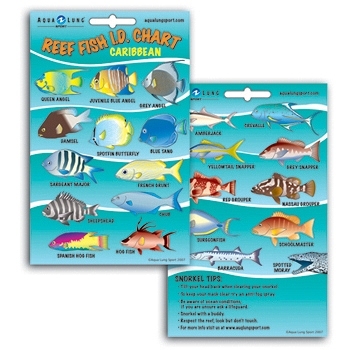 The Guide to Reef Fish of Florida identification card by Natural World Press is printed on waterproof 5" x 7" plastic. Shows over 70 fish in color! Hole punched at top to secure a lanyard for underwater use. Great for snorkeling and diving! 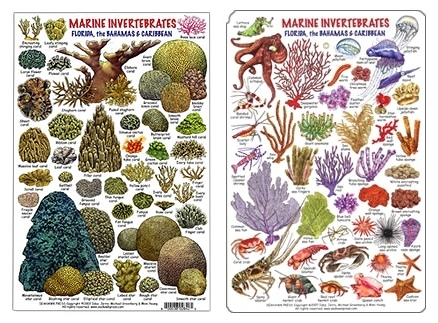 A two-sided, waterproof guide to marine invertebrates, including crustaceans, sponges, jellyfish, stony corals, soft corals, mollusks, and more. 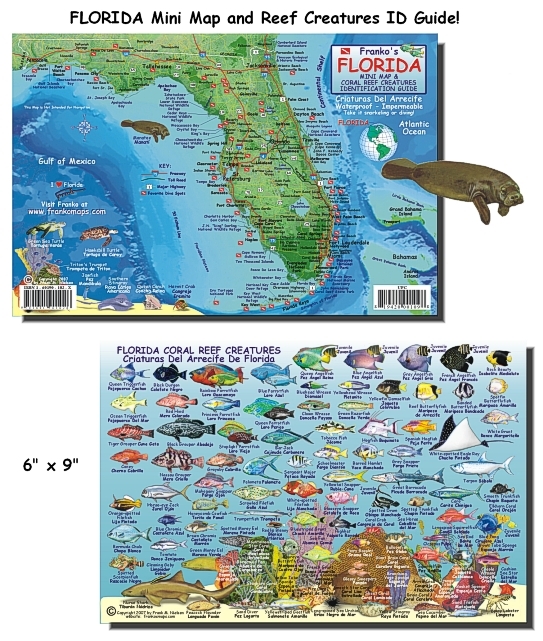 Depicts 89 species found in Florida, the Bahamas, Bermuda and the Carribbean. 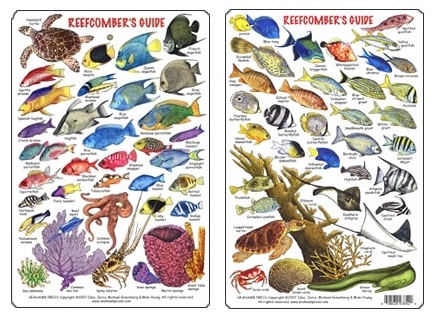 More than 30 Marine Life Scientsts from 8 nations collaborated with the author to compile the most comprehensive and accurate visual identification guide of reef invertabrates ever published. Made for your BC Pocket! "Fish-In-A-Pocket" - A series of waterproof field guides designed for divers and snorkelers. 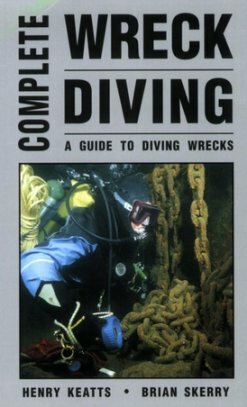 While diving daily, the booklet can be left wet in your BC pocket. After your vacation, simply rinse in fresh water and wipe each page dry. Do not expose to direct sunlight for prolonged periods. 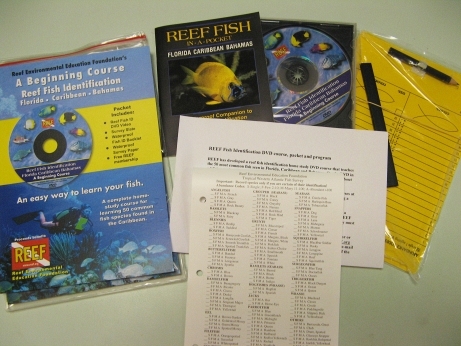 REEF has adapted the popular classroom identification course into a home study DVD package aimed at beginning fishwatchers. 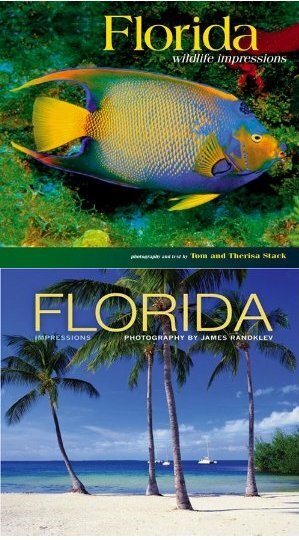 Reef Fish Identification â€“ A Beginning Course teaches the basics of fishwatching, including identification of 50 commonly sighted species found in Florida and the Caribbean. The one-hour DVD enables you to learn the basics of fish identification in the comfort of your own home. Once you have reviewed the content of this self-study tool, you can chose to become a REEF Level 2 surveyor by taking an Identification Exam and conducting two REEF surveys. Contact REEF HQ or a Field Station near you to find out more. 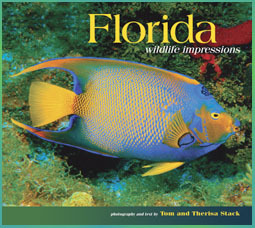 Produced by New World Publications and ReefNet. Winner of the Bronze Award in the 2008 Telly Awards competition in the Non-Broadcast Education category! Yellow fish ID slate with 60 species to list fish sightings and blank profiles to sketch "mystery fish." Has attachable pencil! Waterproof survey paper, good for 2 dives, 2 reef survey data forms, and a REEF decal. 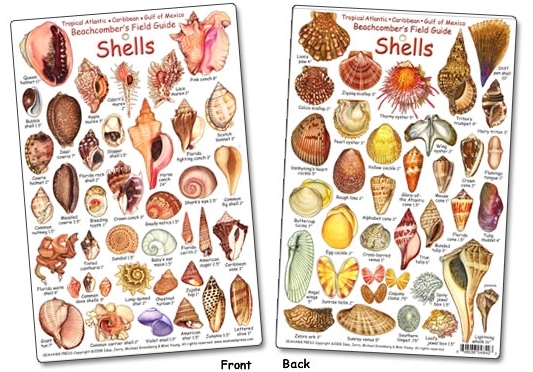 The Reefcomber's Guide to the Tropical Atlantic and Caribbean is a two-sided waterproof card featuring 75 colorful, frequently seen fishes, invertebrates, and turtles. 6 X 9.5"
This slender book, the latest in Voyager Press' WoldLife Library series, provides a concise introduction to this remarkable group of birds from the authors of the outstanding Tundra Plovers. Though classified as "juvenile", the information it contains is relevant to anyone interested in shorebirds. Beginning with a description of shorebird taxonomy based on the latest DNA findings of Charles Sibley and Jon Ahlquist, the book then describes what shorebirds look like, relates their incredible migration schemes, discusses breeding and social behavior, feeding habits and conservation concerns. The largely non-technical text is easy to read and the 50 excellent color plates are well placed to illustrate points in the text. A full list of all shorebirds of the world and a list of extinct or endangered species is included. We especially recommend this book to the novice shorebirder. 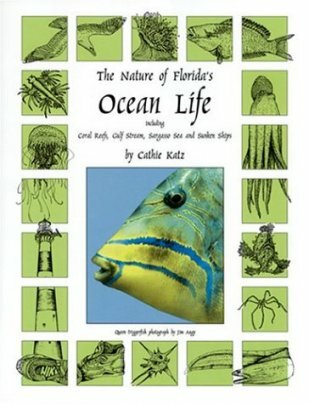 This book looks at Florida's ocean as a habitat, a community of elaborate mini-creatures swimming next to bulky saltwater giants. Drifting alongside these living creatures are inanimate objects--bottles, nurdles, rafts, toys and tar blobs--lost or tossed from cargo ships. They float in the Sargasso Sea or flow with the Gulf Stream, sometimes drifting to Florida's east coast to become part of the sea wrack--the flotsam and jetsam that we find when strolling on the shore. 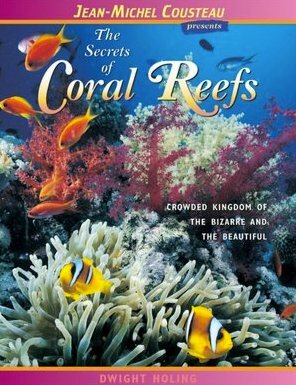 Secrets of Coral Reefs explains in simple language the interlocking community of bizarre and beautiful coral reef animals and plants. Although their stony structures seem impervious to harm, coral reefs are actually fragile communities under siege not by natural forces but by humankind. Featuring dozens of full-color photographs by Francois Gohier, Jeff Foott, Howard Hall, Frank Balthis, and others, Secrets of Coral Reefs explores the incredible diversity of reef-dwellers, the differences between Indo-Pacific and Caribbean reefs, and the complex relationships between reef animals and plants. Stressing the importance of this multifaceted world, the book shows young readers the importance of coral reefs, the reefs' chances for survival, and what they can do to help ensure it.